This bundle has all of the cute and necessary items to make that first outing memorable, fun and trendy... The Changing Pad has an attachable case for storage of sanitizing wipes and a snap strap to hold diapers, the Bib Bottle and Pacifier Holder will save hours of wiping up spills in the car seat and searches for missing Pacifiers, and the matching Blanket and Bodysuit will add to the cute and trendy nature of your first adventure or trip. 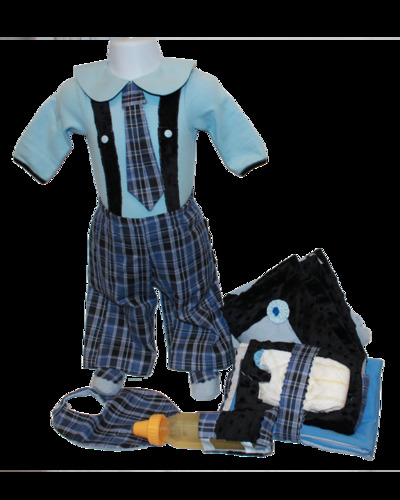 These are made with soft blue and black plaid flannel, light blue stretchable knit fabric and black minky fleece.